bought car with rod knock , used motor installed / old motor spun bearing and block damage / vehicle runs just misfire on one cylinder on new used engine cylinder #5 misfires , all other cylinders are working fine, new dealer oem plugs,coils , and wires/ water pump, ect , everything relating to new engine install . P0305 code after install a mass air flow sensor code was present installed new oem MAF ,swapped injectors/ coil / wires/ and plug from 5 cyl. to cyl 1, noid light result on cylinder 5 steady lit bright light with ignition on, no blink or pulse when cranking or running steady bright noid light / all others pulse on cranking of the engine and when engine runs , checked for short to ground from injector - plug to ecm no short (i physically took apart wire harness to inspect wires) injectors, coil are within ohm spec. i condemn ecm , sent computer out had it rebuilt new fuel drivers installed and board cleaned /got ecm back now no light on noid light , no blink no pulse on cylinder 5 all others fine . 12 v on 1 +wire of injector connector -10 mili amps on negative side on dvom . i cant figure this out, since ecm came back codes present p0305 misfire cyl5 / p0155 o2 heater circuit bank 2 sensor 1, would this be an intentional injector shut down by ecm? Chances are that your pcm still is bad if the involved components and the wiring proof good. I leaning towards ecm still bad as well , this is what I'm getting from the wire corrosponding with the ground side of the injector from ecm. Yes I cut the wire, so that is the gray-yellow wire from ecm pin 28 on the schematics , this ecm is vin coded , so I can't just swap ecm in this case. And I am getting running voltage on the other side of injector plug. Just double checked. Other injector and coils as. Quick Compression test 150 psi, didn't do leak down test though. well. Last edit: 11 Mar 2018 13:21 by Shortie. 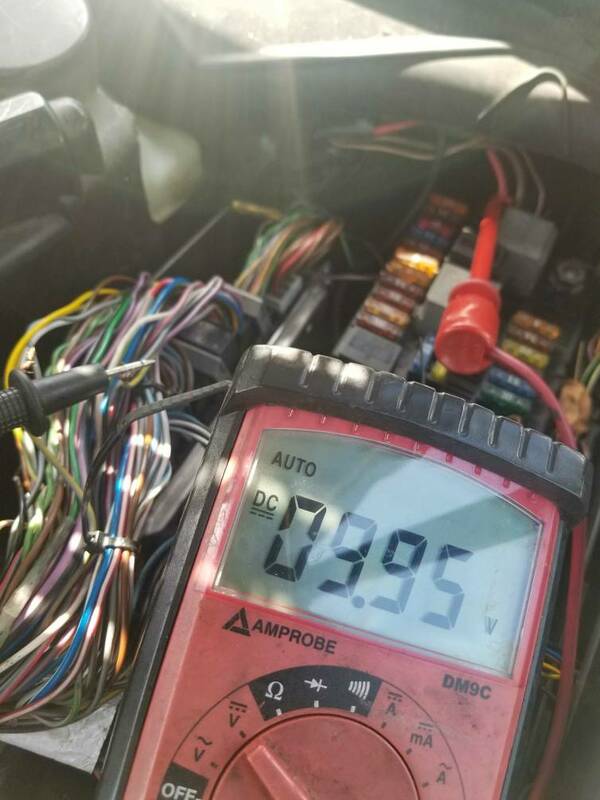 Volt meter isn't a very good choice to check an injector circuit. It is not any where near fast enough. bruce.oliver wrote: Volt meter isn't a very good choice to check an injector circuit. It is not any where near fast enough. I'm home it's Sunday, i ran out side just now and did a quick double check, on other coils and wires , can check with my scanner at the shop this week. Problem solved, new computer shop, bad inector driver on main board.